It was in 1888 that John and Rosalie St. Clair came to the United States from Alsace-Lorraine France. From Crystal-City, Missouri they moved to Elwood, Indiana with their children John and Rosa. Paul L. was born in Elwood in 1891. A young John married Ellen Carroll July 15, 1903 and set up housekeeping at 408 N. 5th St. Together their family grew to eleven, five sons, John, Paul, Joseph, Edward, and Robert; and six daughters, Marie, Rosella, Dorothy, Ellen, Margaret, and Jane Ann. Ellen died during the influenza epidemic at the age of two. The discovery of natural gas awakened the once sleepy town to new industry. MacBeth Evans opened a large glass facility around the turn of the century. Pop and his sons went to work developing their skills as master gaffers. In most glass manufacturing houses of that era employees were encouraged to practice, invent, improve and create after regular working hours. John returned night after night to perfect the art which was a part of his native country’s culture. The St. Clair sons went with their father to watch and learn the techniques that have become the time honored, intricate flower design. In 1938 the gas boom faded and all the St. Clair's moved to Dunbar, West Virginia, except their son Joe. producing handmade art glass. The business continued to grow with the help of some large accounts such as Marshal-Fields in Chicago. Pop’s health began failing, even so he was still “the boss” until his death in 1958. Joe assumed command of the plant with the help of Ed and Bob. In 1959 Joe began experimenting with color and molds, thus the new press ware era came on in 1960. 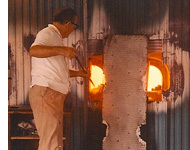 A fire in 1964 led to an opportunity to further expand the growing art glass business. A new larger facility was erected adjacent to the original plant and helped usher in a new era for St. Clair Glass. Carnival glass collectors played a huge role in exciting Joe with his experiment in color and pressed glass. By 1967 Joe’s carnival glass was a great success in molds such as the Indiana Chieftain, Inverted Fan and Feather, and Holly Band patterns. Joe and his brothers, with the help of Bill McElfresh began pressing glass two to three months each year, but continued creating beautiful handmade art glass the remainder of the time. Joe accepted an opportunity to “retire” in 1971. The factory was sold to Robert Courtney and Richard Gregg. 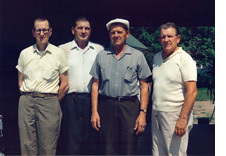 Bob, Ed and nephew Joe Rice also left work at St. Clair to help Bob start his own small facility in West Elwood. of this once sleepy little town. The Elwood Glass Festival was born and was an instant success, bringing glass enthusiasts and new collectors to the area. The glass festival is still held the third weekend of August and remains a tribute to the past. Higher gas prices and increased labor costs eventually forced Mr. Gregg and Mr. Courtney to sell the business back to Joe St. Clair who returned it to the small family operation. Joe continued to work at the art he loved so dearly until his death in October 1987. 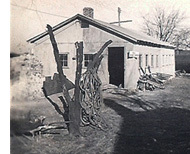 Brother Bob quietly began to build a small glass studio in the back yard of the home he shared with his wife Maude. When Joe sold St. Clair Glass, Bob was ready to leave his personal stamp on the family history. 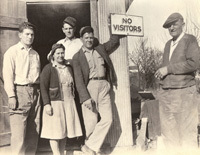 Bob and Maude St. Clair with the help of his brothers Ed, Paul, as well as Jane’s son Joe Rice and Maude’s son Jack Hutcheson, began another era of St. Clair glass. Moving to its present location on State Road 28 in West Elwood, they continued the families’ tradition crafting floral weights, special presidential sulphides, and rose weights. Joe even came and helped his brother get started in exchange for the opportunity to continue making the rose weights that he loved to create. In 1974 Joe re-purchased the original St. Clair Glass Works. The two brothers in separate glass houses continued producing the wonderful floral glass collectibles for which they had become famous. Both businesses grew and thrived well into the 1980’s. The passing of Bob in 1986 and Joe in 1987 virtually put an end to the rich glass heritage in Elwood. But the time honored traditions of the St. Clair glass continues with third generation grandson, Joe Rice. Joe Rice began working at the family glass factory in 1962 at the age of twelve. He soon discovered a passion for creating glass art, working with his uncles Joe, Ed, Bob, and Paul after school hours and during the summer months. Years of practice, often working through breaks and returning to the factory after hours instilled the seed of dedication to fine craftsmanship and the love of glass. 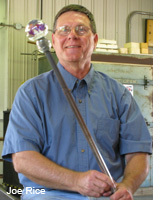 Creating beautiful collectable paperweights and many traditional glass pieces remains a time honored family tradition. Joe has been blessed working alongside his talented uncles. The estate of Bob St. Clair was ready for public auction when Joe suddenly died. It was in October of 1987 that Joe Rice was able to purchase the property where his Uncle Bob created his art glass. Joe was fortunate to purchase all the needed supplies and equipment and reopen The House of Glass. Joe’s uncles Ed and Paul were there to help guide him along his path to success. Today, Joe and crew at The House of Glass continue to create art glass modestly priced and available to the discerning collector. He continues to craft art glass from his family tradition, while embracing new ideas and techniques only recently available. Glass enthusiasts will readily see the connection to the rich heritage of St.Clair glass in the work of Joe Rice. He will always treasure the gifts he received and the skill needed to pursue the dream lived out by his grandfather and uncles. Come visit us at The House of Glass! Jane A. begot Joe Rice, the current craftsman and owner of House of Glass.